My Thoughts: I'm really late to hop onto the Soul Screamers band wagon. I wanted to wait until more of the books were released to start. I finally gave in and started reading. We are introduced to Kaylee who is a high school student. She lives with her aunt, uncle, and cousin in Texas. Her mom died when she was younger and her dad is away in Ireland. She blends in pretty well at school, has a best friend, and pretty much keeps it low key. One day she's at a club and she starts to have a "panic attack." This isn't her first one and probably won't be her last. She sees a girl and sees a shadow around her. Next, in walks Nash Hudson who is absolutely beautiful. He's has more conquests than she can count on one hand. He's a football player, popular, and hot! Kaylee finds out the next day, the girl died. Why is she seeing shadows around people, than the next day they end up dead? What could that possibly mean? Nash and Kaylee's best friend Emma pull her outside the club and try to calm her down. She finally calms down and ends up driving them both home. The next day she goes out with Nash and starts to become his friend. They start to get close and share things. As the story progresses she learns a lot more about Nash and about herself. She also meets Nash's friend Tod. I really liked Tod. Just something about him that made me swoon. Right now, you could say I have a thing for both Tod and Nash. In their own different way, they are both hot and mysterious. Kaylee starts to see and hear about more girls dying. She wants to know the connection. She doesn't understand what is happening to her. I honestly don't want to say much more about the plot or else I'll ruin it for you. I really liked discovering what Kaylee was. 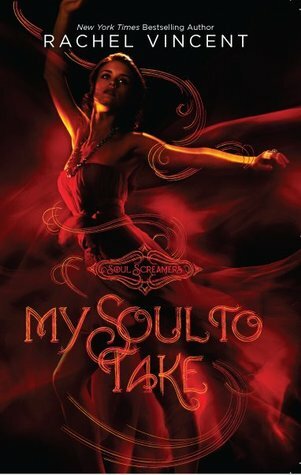 My Soul To Take had me laughing out loud at moments. The dialogue flowed smoothly and it was an easy read. I also loved the ending. I loved hearing who Tod really was and his story. I loved getting to know more about Kaylee and I loved Nash! Swoon! Overall: I really loved this one! I love all the characters. I can't wait to read the next book in the series. I'm so excited to start it! My Soul To Take was a nice YA paranormal read with romance sprinkled throughout it. Team Nash or Team Tod? I don't know yet! Cover: I adore it. I love the red. I love how the girl feels like she is just flying there. Letting free. I'm late to jump on the soul screamers wagon too. I was thinking about joining but I keep holding back. I didn't want another paranormal read like all the others. I just might try it out now. Great review!